Saute onion and celery in butter until soft, but not brown. Stir in flour until well blended. Add chicken stock, stirring constantly and bring to a boil. Remove from heat and rub through a sieve. Add peanut butter and cream, stirring to blend thoroughly. Return to low heat, but do not boil. 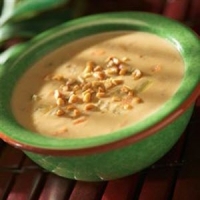 Serve and garnish with peanuts. Serve 10 to 12. Also good cold. 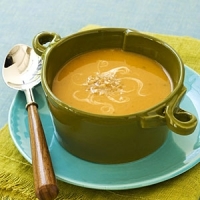 Recipe categories: Soups & stews, Bisques/cream soups, Low Carb.